I am a very keen cyclist, and often commute to work and go out on long weekend rides. I like to carry as little as possible on any of my rides. This is not always practicable on commutes to work, but not much of an issue as I carry a small rucksack. Most cyclists opt for a saddle bag. I am not too keen on this, as I use a fly6 with my Orbea, and a Garmin Varia on my Canyons, both of which are mounted on the seat post, leaving little room for a saddle bag. I have seen some cyclists using pannier bags, but as a ‘roadie’ do not want to add any unnecessary bulk. 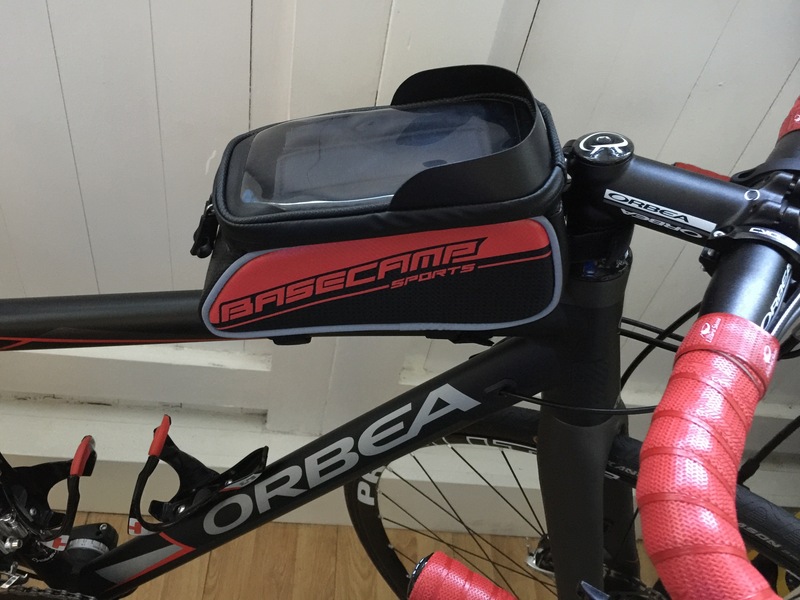 I was contacted by Base Camp and asked if I would like to review their bicycle bag, which mounts on the top tube. I agreed and ordered the item, which was fulfilled by Amazon and shipped quickly. The bag itself came well packaged and in a cardboard box. First impressions are very positive. The bag has a tough exterior, making it waterproof. It was easy to attach to my top-tube/stem, using the velcro straps. It actually felt a lot more snug and stable than I had envisioned. There is a main compartment that is opened by a zipped enclosure (which can be secured with a small padlock). 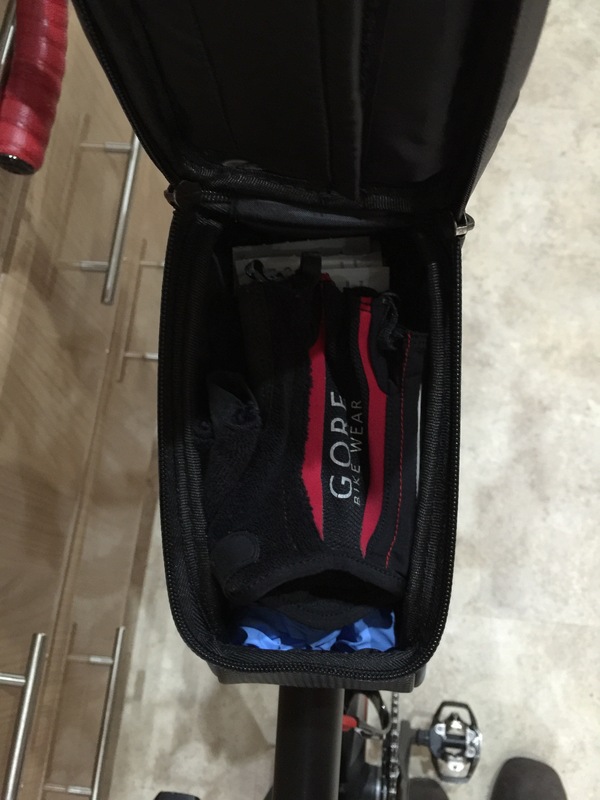 It measures 21.5cm x 10.0cm x 9.0cm, and is large enough to hold a pair of cycling gloves, CO2 canisters, spare inner tube and even some snacks. This is much more than even the largest of saddle bags can hold. As the bag is located on the top tube, it is right in front of you as well, so you don’t need to get off your bike to gain access. Probably the biggest positive about this bag is that it also keeps your phone mounted in front of you. 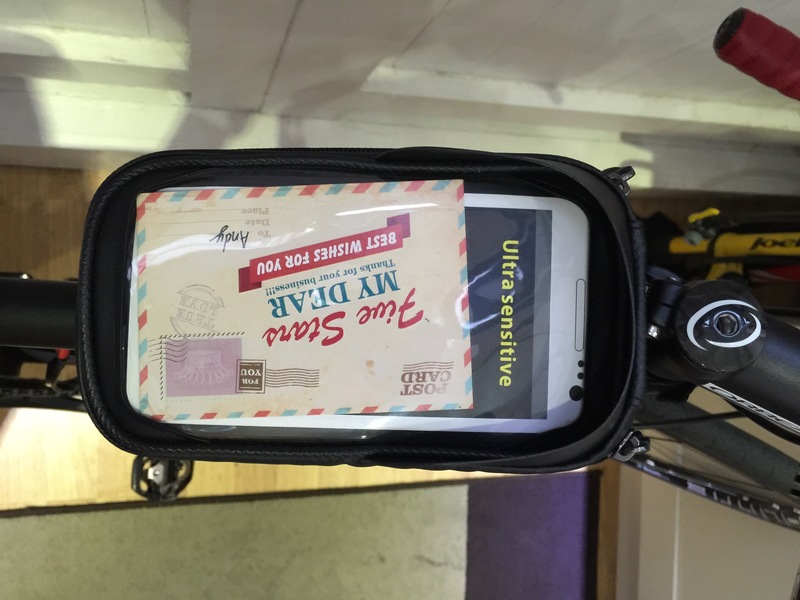 Simply slide your phone into the top sleeve, and you can then view and access your phone whilst out on your ride. On a separate note, I personally wouldn’t take my eyes off the road and only ever use my phone when I am stationary. But I digress. Having your phone located in front of you is still ideal for using maps for navigation (or Strava, if you don’t use a Garmin unit), allowing you to take a quick glance. The phone is protected by a plastic cover, and you can still use the phone’s touchscreen through this. I have taken the bag on a single ride so far, and it has held up very well. There was no movement whilst riding, it was very stable and my phone stayed in place. Also included with the bag is a rain cover and a wrist-strap compass. On my commute I normally have a lightweight rucksack, so have no need for an additional bag which only adds bulk to my bike. I will personally be using this bag for any sportive I do, or possibly very long weekend rides. This will free-up space in my jersey pocket and allow me to carry some snacks. I would highly recommend this bag for anyone needing something larger than a normal saddle bag, or if you don’t have the space under your saddle.